This is the first post of two dealing with comparatives between Irish and Icelandic economies during the ongoing crises. The post was motivated by a number of recent articles in Irish press presenting Irish situation in terms of the allegedly stronger crisis performance than Iceland, as well as Paul Krugman's response to these (here). This post will deal with real economy comparatives, while the second post will deal with fiscal performance relatives. Both economies experienced deep crises in 2008-2010: Icelandic economy contracted to 90.41% of 2007 levels by the end of 2010, while Irish economy declined to 92.13%. Per IMF Q4 2010 forecasts, Icelandic economy is likely to reach 103.12% of its 2007 level GDP by 2015 while Irish economy is expected to reach 106.10%. However, latest revisions to 2011 forecasts (but not yet to 2011-2015 period) suggest that this advantage of the Irish economy over Icelandic economy is unlikely to hold. 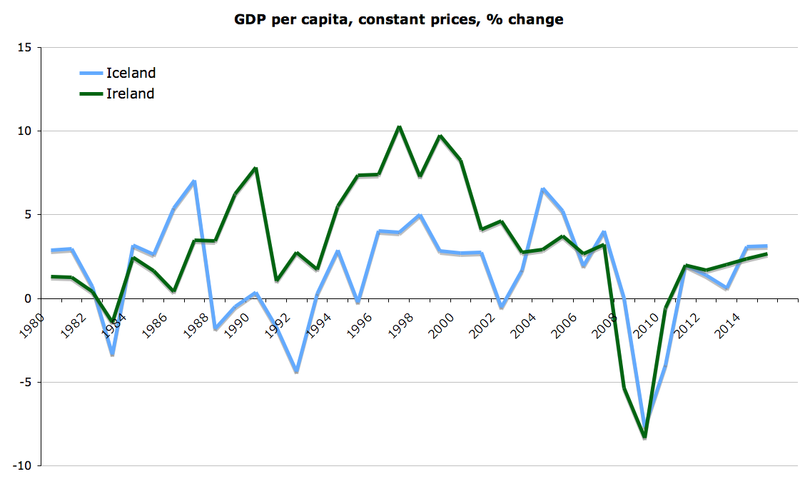 In terms of real GDP per capita Icelandic economy contracted to 88.64% of 2007 levels by the end of 2010, while Irish economy declined to 91.08%. Per IMF Q4 2010 forecasts, Icelandic economy is likely to reach 98.05% of its 2007 level GDP by 2015 while Irish economy is expected to reach 106.10%. Again, latest revisions to 2011 forecasts (but not yet to 2011-2015 period) suggest that this advantage of the Irish economy over Icelandic economy is unlikely to hold in the next IMF database updates. 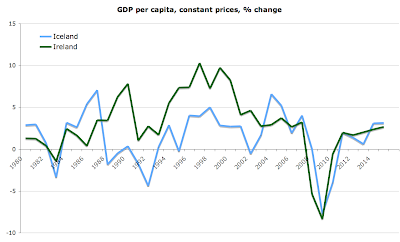 In terms of GDP based on purchasing-power-parity (PPP) per capita, Current international dollars, Irish economy has contracted by 10.25% in 2010 relative to 2007, while Icelandic economy declined by 7.75% - much less. Why? This result is especially worrisome, given that over the same period Irish economy experienced deep deflation (see below), while Icelandic currency was devalued substantially. 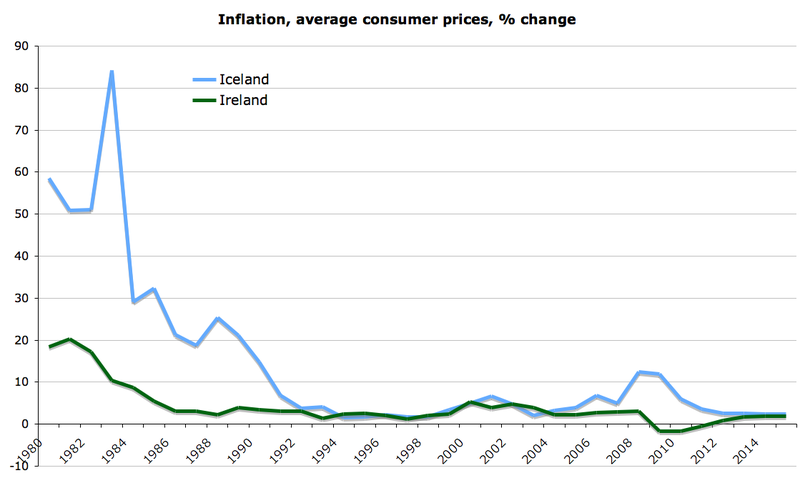 Thus, Irish purchasing power should have risen, while Icelandic purchasing power should have fallen. And yet, real purchasing power of Icelandic income earners held up better than that of Irish counterparts. 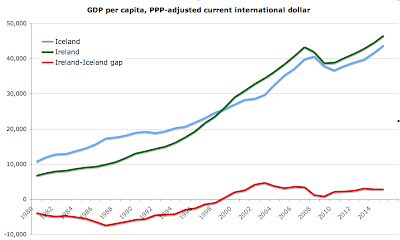 In projections through 2015, the IMF expect that per capita, PPP-adjusted GDP in Iceland will reach 10% above 2007 levels, while in Ireland it will reach 7.58% above 2007 level. This, once again, means that the IMF expect Icelandic income earners to fare better than their Irish counterparts. The same is reflected in the gap between GDP per capita in Ireland and Iceland. This gap stood at 3,487.63 in favour of Ireland in 2007. By 2009 it fell to 832.61 and by 2010 rose to 2,135.11 still below 2007 levels. According to IMF projections, the gap is expected to be 2,788.53 by the end of 2015. Notice that the average gap between 2008 and 2015 will remain below its historical average levels for 2000-2007. This confirms that much of the underperformance in terms of absolute real GDP per capita discussed above is due to (1) historical trends and (2) price differentials between the two countries. What about economic performance in the two countries relative to the global economy? Chart below shows the shares of each economy in total global GDP. 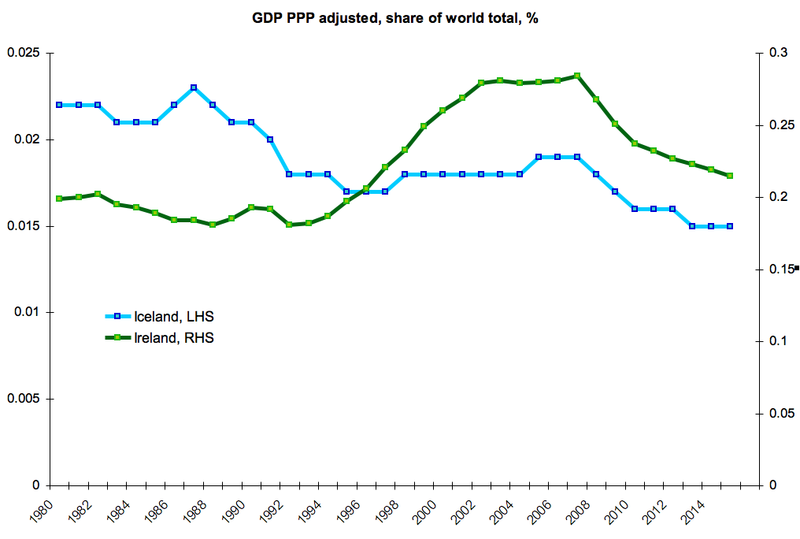 In 2007, Iceland accounted for 0.019% of the world GDP, while Ireland accounted for 0.268%. By 2010 these shares were 0.016% and 0.237 respectively. 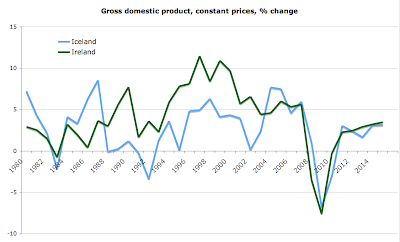 The decline in Iceland was 15.79% and in Ireland 16.55%. So Iceland outperformed Ireland here. By 2015 IMF expects Icelandic economy’s weight in the global economy to be 0.015% - a decline of 21.05% on 2007. For Ireland the same forecasts imply 0.215% weight in the global economy and a decline on 2007 of 24.30%. Again, Iceland is expected to outperform Ireland into 2015 in these relative (to global economy performance) terms. 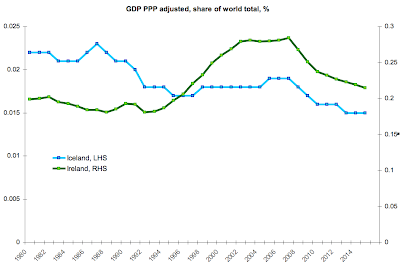 Comparatives with Iceland aside, however, Irish economy is expected to reach, by 2015, virtually identical level of global economy share as it enjoyed between 1996 and 1997, in effect erasing the entire period of some 20 years worth of economic growth. 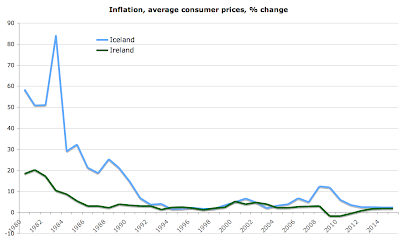 As I mentioned before, Ireland clearly showing real deflation trend during the crisis, which is not the case for Iceland (in part, Icelandic inflation reflects devaluation of its currency). It is worth noting that moderation in Icelandic economy inflation has been dramatic and highly orderly since 2008-2009 peak. This shows that the economy is expected to be adjusting through its post-default and post-devaluation period in an orderly fashion. In contrast, Irish deflation during the crisis has been pronounced and persistent. Now on to unemployment. 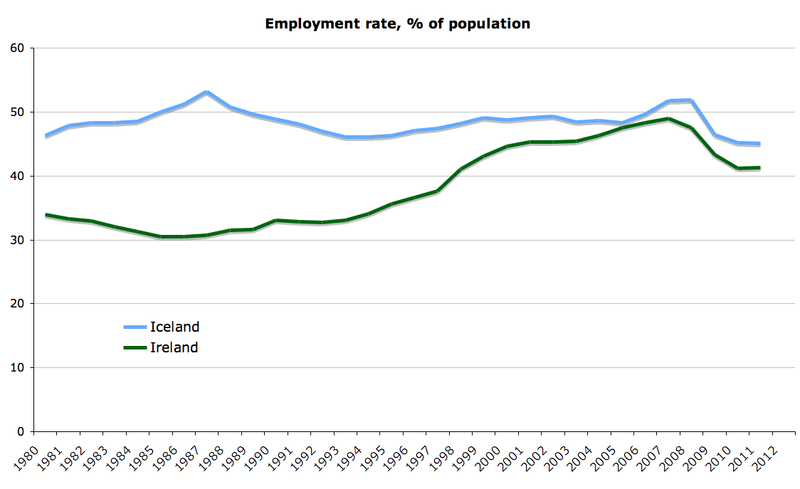 It is clear that Irish unemployment is running at the rates more than 50% above those in Iceland. By the end of 2015, IMF forecasts Irish unemployment to be 9.5% and Icelandic unemployment to be 3.12% or more than 3 times lower than that in Ireland. Again, note the dynamics of expected adjustments to peak unemployment in the two countries. 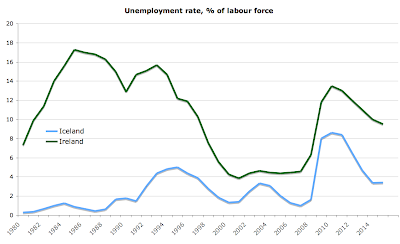 IMF clearly forecasts unemployment to decline in Iceland at a much faster rate than in Ireland. Given that icelandic unemployment declines are more likely to arise from jobs creation, rather than emigration, while Irish unemployment declines are robustly influenced by rampant outward migration of displaced workers, these dynamics also reflect the deeply-troubled nature of the Irish economic crisis, when compared with that of Iceland. Which, in turn, shows that more likely than not, stronger Irish performance in GDP growth terms above is really driven by the MNCs and their transfer pricing, rather than real economic activity at the domestic economy. Lest I be accused of voicing anti-MNC sentiments - we do live in a society where saying factual things can get us labeled anything totally unrelated to the factual evidence presented - MNCs activities are great. All I am suggesting is that counting on them to carry us out of our real economy collapse (unemployment, shrinking employment, declining real disposable incomes etc) might be a bit naive. Although IMF provides no forecasts for employment numbers after 2011, we can use population statistics and employment numbers through 2011 to compare two countries in terms of employment rates as percent of total population. In 2007 51.76% of Icelanders were in employment – a percentage that declined to 45.20 in 2010 and is expected to fall to 45.09% in 2011. 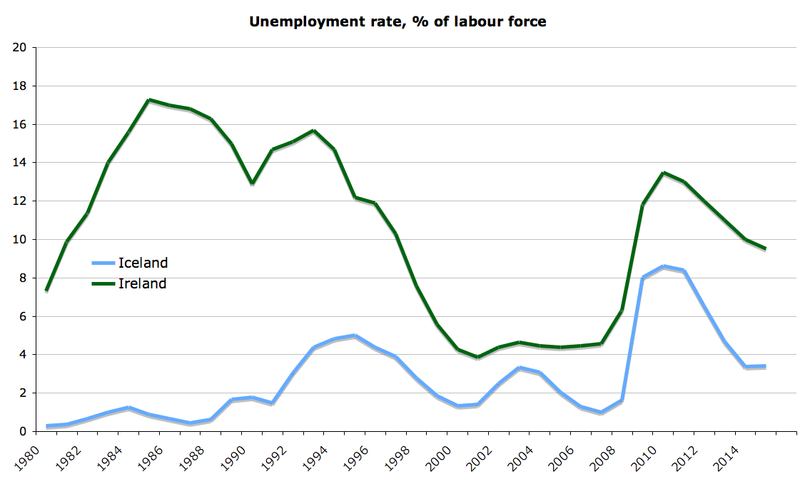 In Ireland, 2007 employment rate was 48.93%, and this has fallen to 41.18% in 2010 and is expected to be 41.33% in 2011. Again, in terms of employment rates Ireland is far behind Iceland – a sign that although out workers might be more productive (with a large share of this productivity accounted for by the transfer pricing by the MNCs), we tend to have smaller share of people working. Do notice that the Icelandic economy performance in terms of employment takes place against the backdrop of having younger population than Iceland. 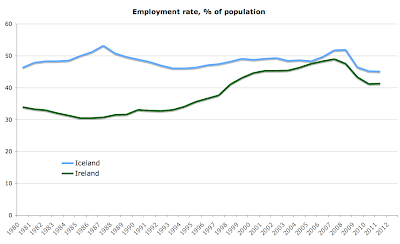 Over the period of time covered, Iceland showed relatively stable rate of employment, while Ireland posted dramatic increases in employment rates during its growth period. This means that our current performance in terms of employment rates cuts against our demographic trends, while that of Iceland is in line with their demographic structures. In other words, one could have expected a decline in Icelandic employment rates even absent the crisis, while we should have expected continued increase in Irish employment rates absent the crisis. 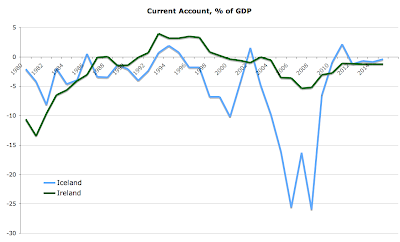 In terms of external trade, both countries have improved their chronic current account deficits throughout the crisis. However, the great exporting nation of Ireland have seen much more shallower improvements than those found in Iceland. Krugman makes exactly this point in his article (linked above), but he considers net exports instead of the current account. 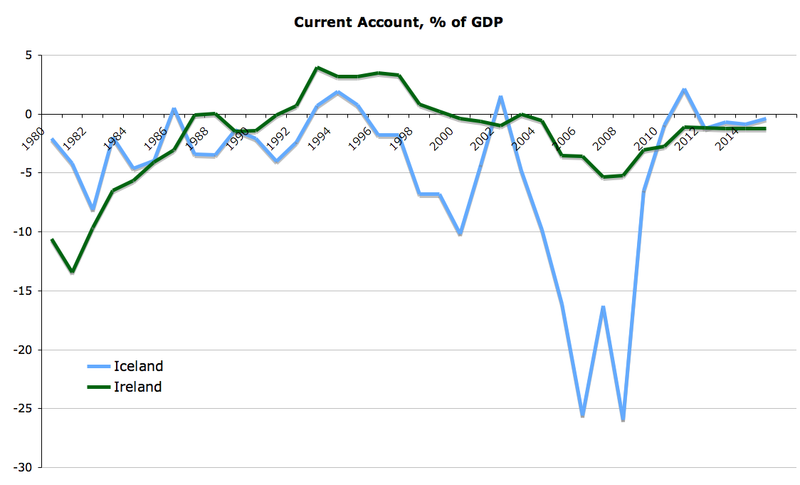 Chart above shows that between 2007 and 2010, Icelandic current account deficits fell from 16.29% of GDP to 0.91%. The Icelandic current account deficits are expected to continue declining through 2015, reaching forecast 0.38% of GDP by 2015. In Ireland, 2007-2010 decline was from 5.24% to 2.73%, while by 2015 the current account deficit is expected to fall to 1.24%. As we show in the next post, much of the reason for better external economic balance performance of Iceland is due to lower transfers from Government to the foreign bondholders, s Icelandic debt is expected to perform much better through the entire crisis. This means Icelandic current account is going to be relatively stronger than Irish one, as Ireland is expected to lose increasingly larger share of its economy to payments to foreign debt holders in years to come. Next post will cover Government/fiscal policy performance of the two countries. P Krugman is a "lefty" shill. Since he has a Nobel, like Obama, "it is official"
I look forward to seeing increasing divergence between the performance of the two Island Republics. Adams will undoubtedly add the six counties in due course. A very enlightening post. I hope your next post will look into the interest rate issue - there seem to be some misconceptions floating around. "Very high interest rates, which were hiked to 18 per cent in an attempt to stabilise the currency, further hit heavily indebted Icelanders." "The fallout was immediate and massive: the currency collapsed and capital controls imposed to prevent it falling further, interest rates soared to achieve the same end"
O'Brien is mistaken in thinking that Icelandic interest rates were raised after the collapse. Rates have steadily come down since 2008 and are now at 4.25% (http://tolur.island.is/). O'Brien is also not entirely right in implying that Iceland didn't have a housing bubble or that the Icelandic construction sector has not suffered big layoffs, though it is true that this is not as big a part of the Icelandic story as it is of the Irish one. 4/02/2011: Can economy function with shut banks?